"Leslie's Cakes" services cover from your cake decoration to your entire cake table for that extra special impression. All cakes include artistically designed cake board to match your special occasion. Create the perfect look and the perfect number of servings for your cake.... Stack Your Cakes for no extra Charge for any occasion! Filling charges vary depending on the size of the cake, the type of filling, and the amount of filling layers. 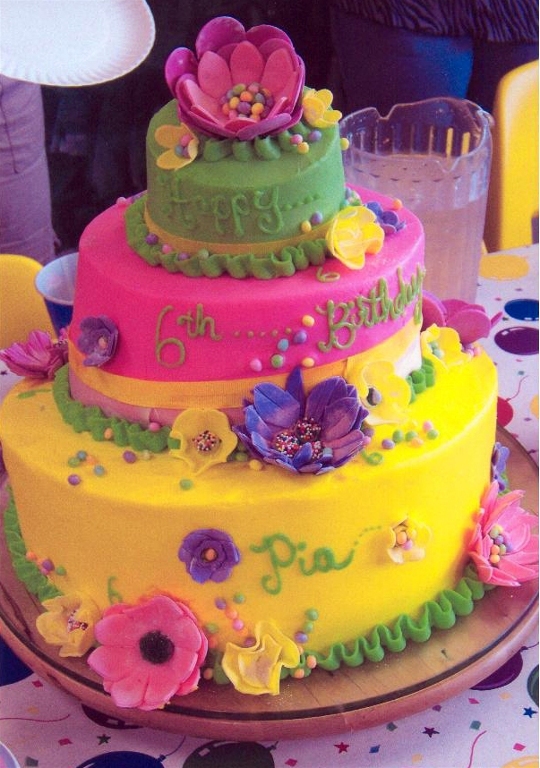 The charges for the extra Filling Layers vary from $2.00 for smallest size cake to $25.00 for the largest size cake. Any Icing Flavor of choice may be used to fill a cake. There is no charge for layer cakes that are filled with the same Icing chosen for the outside of the cake. Single layer cakes may be split in half and filled with choice of filling. All Double Layer cakes have a choice of filling to go between the layers or they will be filled with the outside chosen icing. Cakes can be covered in Rolled Fondant icing with the choice of any other flavor icing for a slight extra charge. Stacked Cakes in any shape or size! (no extra charge for stacking)- For Example: A single layered 4" 8" and 12" cake can be stacked to serve 35 to 45 people. A double layered 4" 8" and 12" cake can be stacked to serve 60 to 80 people. From modern sophistication or simple elegance to the most detailed expressions Leslie's Cakes will make sure that your Wedding and Groom's cakes are perfect for you. Bride and Groom Cake pricing will vary from $2.50 to $5.00 a serving depending on the type of cake, filling, icing, decoration and adornments. Ribbon lined extra thick cake boards. German Silver candle stick holders (refundable). Silver, baby blue, and baby pink cake stands.